Synopsis: A smart mouthed and quick witted trumpet player, Spike Milligan, gets called to serve his country during world war two. While training at a British artillery base, high jinks run amok and the grim realities of war are made real. 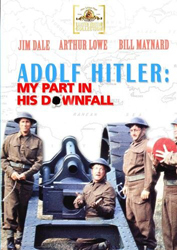 Review: This is a film adaptation of the memoirs of comedian Spike Milligan's experiences during the second world war. This movie pays out what you expect from a British comedy, from snarky comments to over the top slapstick. Surprising enough, almost none of the gags are dated. I can only think of one during the whole run time and that one you still got it because of the context. One on the greatest elements of the film is the contrast between the comedy and the pure realities that was taking place all around then. You get a real sense of the loss of innocents. Spike Milligan actually plays his own father in the movie. The cast is mostly made up of little know British actors, but everyone of them pulls their weight and keeps you glued to what's next. I was surprised by the film quality with it being a demand release by the parent company itself. I used the trailer on the disk as a reference to compare the film to, to see how well they did on touching up the movie since the first thing you see when you hit play is a notice that the DVD was made using the best source material available. I have to say that I'm floored on the quality of such an uncommon movies with a limited budget for it's DVD release. There is a very minimal title screen and the only options are to watch the film and to watch the trailer. I would of liked to see an interview added with the real Spike Milligan since, at least for me, after watching the movie it made me want to find out more about the real Spike's life. I do have to say that none of this detracts from the experience or the value of this release.